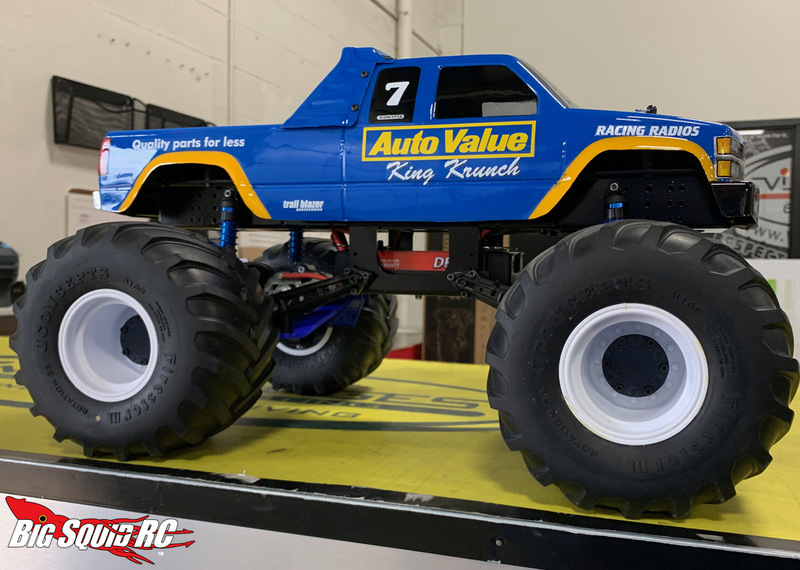 Monster Truck Madness – Ditchin’ the Foams « Big Squid RC – RC Car and Truck News, Reviews, Videos, and More! Greetings everyone and welcome to another edition of Monster Truck Madness! The great looking retro truck that’s being shown off here was built by my friend Lonny Childress. When talking about the build with him, the subject of foams came up. Specifically, the lack of them. The conversation reminded me that it was something I wanted to touch on here! If you are building an old skool monster truck, whether it’s just a box stock Clod to bomb around in or a full-on leafer, the suspension is always going to be a point of contention. While some of the fun of driving a rig like this is the bouncy suspension, it’s not the easiest on parts and can make for a vehicle that’s hard to handle. So with the suspension travel being limited, the big tires are left to do the bulk of damping work. For the longest time stock Clod Buster tires and wheels were what was used. Tamiya didn’t make foams, so no foams were used. That started to change once companies like Pro-Line and JConcepts started releasing tires and wheels with modern foams. Well the thinking lately, at least as far as the retro trucks are concerned, has been to use the new tires and wheels but ditch the foams. This lets the tire collapse with ease when hitting an obstacle or landing a jump, taking the load off from the suspension. The trucks settle down much faster this way. You’d think not running foams with soft rubber would create a situation to where the tires were constantly rolling over themselves under cornering. As long as the tires are properly glued, that’s just not the case. The solid glue job and small holes in the wheels allow for a very accurate representation of air pressure, much like you’d find on the full size trucks. Doing this will help in both bash or race applications! Now, this really only holds true for the classic styled trucks, though. You want quality foams on a rig with a good suspension so it can do the work. The old skoolers aren’t going to get much air. If you sky out a pro-mod style truck with no foams, well, it probably isn’t going to be pretty. That’s a great way to bust a wheel! So yeah, if you wanna get down with a 1980’s style ride don’t be afraid to pull the foams out and experiment! You just may find that that’s the ticket.